By Jessica Wohl Illustration by Walter Newton. Published on March 18, 2019. It's not an easy time to be in the restaurant business. Labor and food costs are rising. Competitors always seem to be touting new items or value-driven deals, or both. Add to this the ongoing battle to be the best in areas such as on-the-go ordering and speedy delivery, and it's clearly rough out there. And while consumer spending at U.S. restaurants and bars is expected to rise 3.9 percent in 2019, according to research firm Technomic, that's just a bit healthier than the 3.6 percent growth in 2018 and 3.5 percent increase in 2017. "It's a low-growth environment," says David Henkes, senior principal at Technomic. So, yes, while there are some standouts (we see you, Chick-fil-A), the broader industry is struggling to maintain or grow market share, and chains are striving to come out the dominant player. 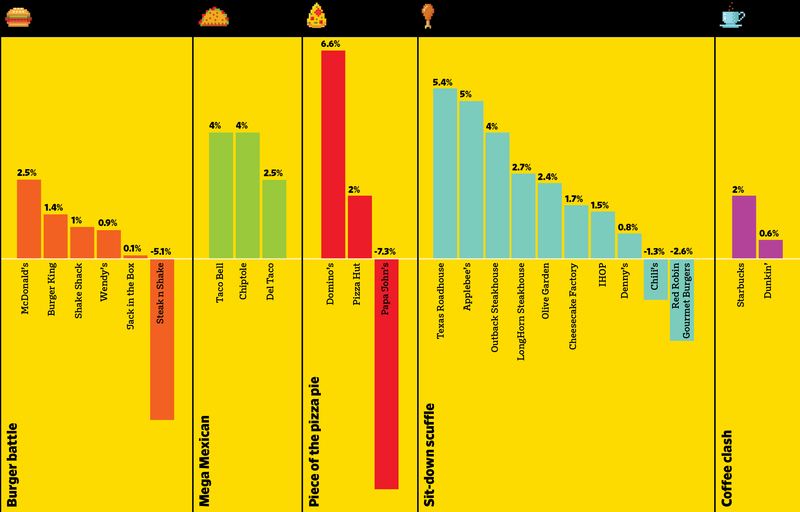 Here, a look at how the restaurant battle is playing out across three big sectors. Let's get one thing straight: This is Ronald's world and others just play in it. 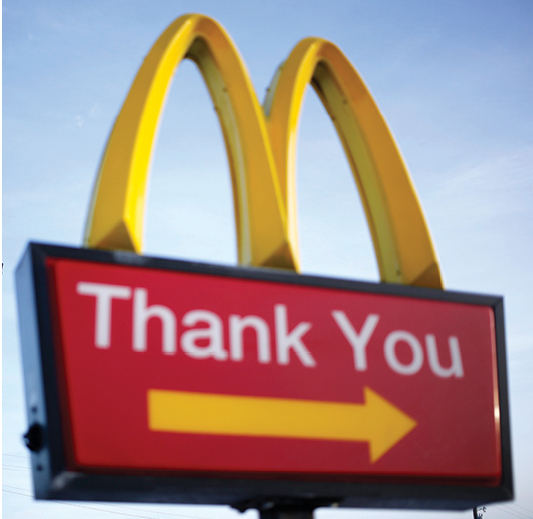 Even though McDonald's U.S. systemwide sales growth slowed to 2 percent in 2018 from 3 percent in 2017, a gain is a gain, and its sales dwarf those of any other chain. "As long as they continue putting positive numbers on the board, nobody's ever going to catch them," says Henkes. The main chain to keep an eye on, according to pretty much everyone, is Chick-fil-A. It just wrapped up its 51st consecutive year of sales growth, raking in more than $10 billion in 2018 even though the restaurants are only open six days a week. Chick-fil-A, the top chicken chain by a wide margin, is also now the fifth-largest restaurant chain in America, pushing Burger King down into sixth place. Meanwhile, the coffee clash continues. Starbucks isn't letting Dunkin's western expansion get in its way. Both chains have added hundreds of locations, and coffee is adding a higher percentage of new venues than the overall fast-food industry. "The industry is growing too fast, and they're growing twice as fast as the industry," says Howard Penney, who follows restaurants as managing director of Hedgeye Risk Management. In the pizza business, Domino's dominates. Its fourth-quarter comparable sales rose 5.6 percent, though that number disappointed investors who were anticipating an even bigger increase. But Papa John's, where comps fell 8.1 percent, would give away pepperoncini and tiny tubs of garlic sauce for life to get that kind of growth. Pizza Hut's comparable sales rose 1 percent in the quarter. But it's not only Domino's that the other pizza chains have to compete against. There are tens of thousands of local shops, many of which are starting to do a better job of taking online orders and having rapid delivery, either on their own or with vendors. What's more, pizza faces quick-growing, quick-fired fast-casual chains. The fast-casual sector, which sits between fast-food and full-service restaurants in terms of service and price, is expected to grow 7.3 percent on top of last year's 7.6 percent growth, Technomic says. That's stronger than the other sectors, but here double-digit growth was the norm for years. "Fast-casual is still the fasted-growing segment out there," says Henkes, "but it's getting mature." A segment to continue to watch in fast-casual is pizza, where Mod and Blaze are posting stunning double-digit gains. Still, they're a small slice of the overall chain pizza pie. Chipotle, meanwhile, has been making strides under new leadership. Revenue rose 10.4 percent in the fourth quarter, with sales at locations open at least 13 months up a healthy 6.1 percent. Those are the kinds of gains that show people are actually, really, finally moving past those food-safety concerns. Fresh marketing, delivery options and an updated app are helping, and a loyalty program was announced in March. "Chipotle seems to have regained its footing again," says Henkes. Penney goes so far as to call it a "rock star." Conversely, Shake Shack is predicting sales at longstanding locations will rise at most 1 percent this year. And that's with a 1.5 percent price increase taken in December. Despite the meager growth prospects, there's one benefit for diners: Perhaps those lines will be shorter, and delivery, which Shake Shack has been working on with vendors, will be faster. In the casual-dining sector independent restaurants are outperforming chains, which are struggling to get people to come in, sit down and stay awhile for moderately priced meals. In all, Technomic predicts 3.5 percent growth in this space in 2019. It's a step in the right direction. Casual dining sales rose 3.1 percent in 2018 after increasing just 2.9 percent in 2017. Chains to keep an eye on include Texas Roadhouse—which leapt over Outback Steakhouse in terms of overall sales in 2018—and Applebee's, which bounced back big-time last year. A deal's a deal, and the variety of $1 alcoholic drinks it began promoting in late 2017 with the Dollarita got people in the door. "The industry isn't necessarily growing at a significant rate, and it's a pretty good market-share battle," says Joel Yashinsky, who joined Applebee's as its chief marketing officer in January 2018 after working on marketing at McDonald's. "Abundant value is critical for the casual-dining guest," says Yashinsky. Web production by Tam Nguyen/Ad Age.